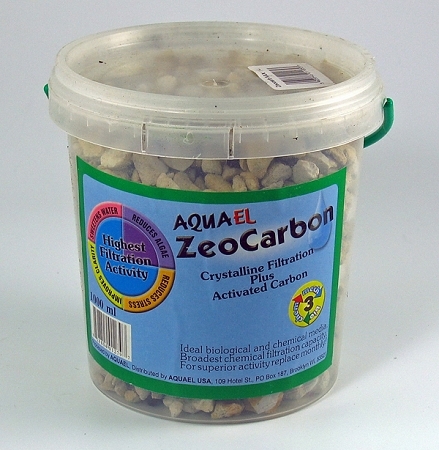 ZeoCarb is a versatile, cost efficient and highly effective form of filtration media for any freshwater aquarium, fish bowl, or backyard pond. Seven times more powerful than activated carbon alone, zeocarbon is a mixture of activated carbon (charcoal) and the natural mineral zeolite that is already included in many AquaEl filtration systems. Activated carbon breaks down organic pollutants to remove foul odors and restore clarity to cloudy or tinted water while zeolite absorbs deadly ammonia. Packed in a convenient see-through bucket with carrying handle for easier use and portability. Available in 1000ML (about 1 qt).